Follow the growing tips and care guide for Spanish jasmine - Chameli in pots and ground, indoors and outdoors with tips to watering, fertilization and pests and diseases; and how to get moe flowers. Spanish Jasmine (Jasminum grandiflorum) is the most widely used in perfumes. It is native to South Asia but now grown in many parts of the world including USA (USDA hardiness zones 9-10), specially in Grasse, the French capital of perfumery. Spanish Jasmine is also known as Royal jasmine, French jasmine, Catalonian jasmine; and Chameli (climber, bel), Jaji, Malati or Mallika and Juhi in Hindi, and Chambeli in Urdu. The Spanish jasmine flowers are very fragrant, the blooms send their fragrances in early mornings and evenings, not only in the garden but far away to neighbors area. This is one of the most cultivated types of jasmine. The other popular jasmine variety is Arabian jasmine (Jasminum sambac or mogra). It is different than the night blooming jasmine, raat ki raani). 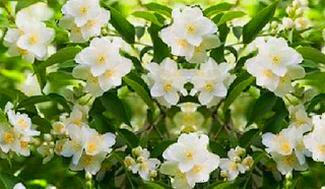 It is believed that to produce 1 kilo of panish jasmine essence 7 million flowers are estimated to be needed. The vine Spanish jasmine looks similar to the Poet Jasmine (Jasminum officinale forma affine), the difference is that Jasminum officinale has smaller flowers with broader petals. Jasminum grandiflorum is a deciduous shrub growing to about 5 m long with leaves composed of small leaflets of five to seven. The branch tips borne the clusters of unique sweet fragrant white flowers with five lobes 1.5–2.5 cm long. The vine is evergreen in frost-free areas but semi-evergreen and deciduous in cooler areas. Periodic pruning is necessary to control the vines. Prune the plant in late summer or early fall when flowering slows. Remove any damaged or diseased vines as they appear. The propagation techniques for Spanish jasmine are the same as for Arabian jasmine, viz. from cuttings and layering method. You can also start jasmine from seeds, however, growing jasmine from seeds would take much more time than starting from cuttings. Also the properties of a seed grown jasmine plant will differ from the paent plant, where as the rooted jasmine cuttings will clone the parent jasmine plant. Just cut a thin branch and cut below a node. Dip this end in homemade rooting hormone put in the damp soil in a small pot. Cover the pot by a polythene bag and place in shade. New roots will strike in a few weeks. The picture below shows the flowers of Spanish jasmine / chameli flowers on a new plant rooted from cutting. These are the first flowers on the new propagated plant after 6 months. Spanish jasmine needs well-drained fertile soil. Add some river sand to the soil to make it free-draining and some compost or cow manure to make it nutrition rich. Where to Grow Spanish Jasmine? In Pots or Garden Bed? Spanish jasmine can be grown both in pots and garden beds. Advantage of planting Spanish jasmine in a container is that it can be moved indoors in a verandah or balcony. The container should have holes at the bottom to provide drainage for extra water. The planted indoors, it should receive 10-12 hours of artificial light if direct sunlight is not available. While planting the jasmine outdoors, select a location where it receives direct sun light for 4-5 hours a day, however, it can grow well in partial shade also. Also keep in mind that jasmine is a vine which grows quite thick and quickly. Mostly people grow it on a corner of the building to climb on the fence. You can use a trellis if growing in a pot or where a fence is not available. Buy a small jasmine plant from your garden shop or grow your own by propagating Spanish jasmine from a cutting as mentioned above. Dig a hole twice the diameter of the pot of the plant, but the depth should be the same as the plant in the pot. Remove the plant from the pot and place in the hole and fill the hole with soil. Put a 2 inch layer of sugarcane or any other mulch around the plant leaving some clearance near the stem. Put a trellis somewhat away from the roots so as not to damage them. When the Spanish jasmine plant grows, tie the stems to the trellis to train them to move up. Guiding the climber on trellis will protect it from falling down on to the ground when it becomes heavy with flowers. For growing more than one plant, keep a spacing of about 3 m between the plants. Keep your jasmine vine moist, but do not over-water. Allow the soil to dry out between watering. Over-watering may cause root rot. The plant needs to be watered more during summer to prevent dryness of the soil. Feed you Spanish jasmine plant every fortnight in the growing months - spring to summer. I feed my plant with a balance fertilizer high in phosphorus after flowers have finished to encourage new growth and new flowers. If the jasmine plant is growing outdoors in ground, rack the fertilizer in the soil leaving about 10 inch area around the main stem. Water the soil deeply. If your jasmine vine is growing in a container, apply the fertilizer around the rim of the plant. Pinch dead blossoms off of your vine during the growing period to encourage new growth. Prune your jasmine vine heavily before growing time starts, in late winter. You can prune top two third of each branch to keep it from becoming too heavy. Remove any stems growing out from the base. Cut all the dead stems and branches. Sometimes the jasmine flowers do not bloom, although the vine look very healthy with green foliage. Following are the tips to get healthy flowers on jasmine climber. The Spanish will produce blooms from the second year. Flowers should be picked in the early morning when they are the most fragrant. Reduce the nitrogen fertilizer. Feeding the vine with a liquid feed high in potassium every third week will encourage flowers. Follow the pruning tips as mentioned above. Cut the growing tips of the branches if there is no sign of blooms on them. This will encourage new growth and new flowers buds. Jasmine plants can be affected by pests like aphids, caterpillar, spider mites, etc. and fungus disease. To avoid these problems, always water your Spanish jasmine properly without wetting the leaves. Ensure that the vine receives sunlight for 4-5 hours daily. I treat the infested plant with an insecticide, fungicide or neem spray regularly.